When you come down, it feels like someone's drawn thick, black velvet curtains across your entire view of life. It feels fake. It's dreamlike and inescapable. And nothing can reverse the effect. Depression is devastating. It’s isolating, it’s lonely, and eviscerates any shred of happiness. It isn't a melodramatic state of mind—it’s actually as though someone replaced your eyes and mind to both see and process everything as a direct attack on everything you've held dear. The rain comes because you don't deserve the sun. You feel tired and exhausted because why do you deserve to be otherwise? Depression consumes you both physically and mentally. It pushes you to the point that, sometimes, nothing feels worth it. Why should I breathe when there are so many more beautiful, loving, and deserving creatures out there that could use the oxygen? And anxiety is the same way. It's strange to experience them simultaneously. You feel giddy—clammy palms and tapping feet—expecting something that probably won't even happen. Or you're excited about something that, to you, is life changing, but to anyone else, is most likely just another day. Let's go back to February 2013. I was sitting in a chair in a psychologist’s office in a suburb about 30 minutes north of Cincinnati, Ohio. It was early morning, and I should have been at work. But I was manic—and truth be told, being manic and actually knowing you are is almost as bad as being depressive. I got a prescription of generic Depakote—which is actually used to treat epileptic seizures—and left. The truth is, I've been living with this problem for more than a decade now. And it's gotten to the point that I've grown to accept it. Sometimes I want to snap and scream, thrash and hurt. Other times, I want to become nothing. 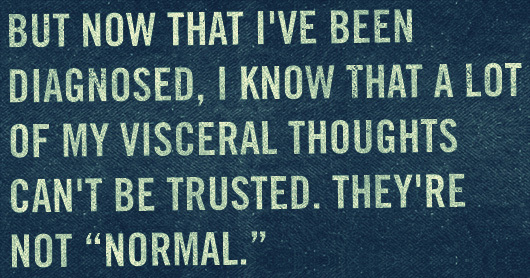 But now that I've been diagnosed, I know that a lot of my visceral thoughts can't be trusted. They're not “normal.” They're not reactions people without this problem have, and I can't take it out on anyone. And that brings us to lesson one in hopefully overcoming the problems that plague me—and possibly you, too. It's not your fault. It's never been your fault. It will it ever be your fault. Feeling the way you do just happens. Unless you're forcing yourself to feel things (which might make you something far more interesting than depressed), never disregard your own feelings. You may need to take a step back and truly assess why you are feeling the way you do, but never disrespect or devalue yourself because of how you feel. This took a long time for me to understand and accept. Depression and anxiety are problems—real problems like having a broken bone—that keep you from experiencing life as “normal” people should. And that's a hell of a lot more excruciating than a broken finger. None of us are invincible. No matter how hard you train your mind and body, we’re all liable to receive some injurious moment that erodes our confidence. The day I was diagnosed, I went back to work and talked to my boss. Now, during this time, my boss was an incredible man with an unparalleled gift to relate to anyone. I trusted him like I trust any of my close friends (which is a case of lucking out, I know), and told him what happened. I told him that some days even the smallest things were enough to obliterate any chance of happiness in my life. I told him that I struggled with alcohol and, at times, wanted to never wake up again. That my days were either dominated by feelings of invincibility or asphyxiating pressure. And that's just the thing: Most people have hit that point—a moment in life when even waking up is a monumental struggle. The lesson here is that the people close to you have known at least some varying degree of what you're experiencing. Whether your heart races every time you even think about social interaction or if your days have an immovable pall draped over them—people know. And if you're close enough to someone that you feel comfortable bringing your problem up to, you will be surprised. Darkness and terror touch us all—either with a gentle fingertip or a full-bodied embrace. When you feel yourself being brought down into the depths, however, you need to stop. Just stop. Stop your Goddamn life and your feelings and get away from everything. Stop thinking—listen to a song you love, do anything you need to do to give yourself a chance to think. You're not who you are normally—you're trying to run with a broken leg. You're succumbing to your anxiety or depression. And you're stronger than that—you're better than that. 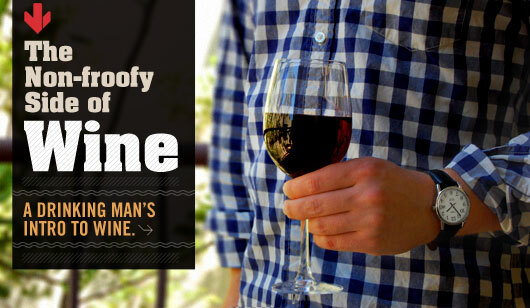 You're stronger than that chemical imbalance. Get a hold of your mind and get out of any situation that makes you feel like you're losing it. Find comfort and then assess your situation. Go see a professional. Get diagnosed. Just know for sure. Whether you get put on Depakote or some other medication, you'll know. You'll know that those extremes in your head—sparkling, beautiful moments and those nights you spend just wondering—are OK. It is OK, guys. It's OK to feel the way you do and there's nothing wrong with the way you feel. There's nothing wrong with having a problem, and the sooner you understand and accept that, the sooner you can feel better. You may not be cured, but you can feel better. Help came to me a little late, but it did come nonetheless. And with help, came understanding and this clarifying realization that I’m going to have to live with bipolar disorder and anxiety most people will never understand. Dr. Daum’s been helping people for years. It’d be wise to take his words seriously. Unless you get forced into seeing a doctor, no one knows that something is wrong but you. Maybe you’ve garnered and embraced a persona of being silent and severe. Or maybe you’re known for being a shut-in and are OK with it. It doesn’t have to be that way, though. Don’t hesitate to seek help if these two lists seemingly describe you. It’s not really possible to truly “get better” from mental illnesses like these. It isn’t like a broken bone in that sense. But you can foster an understanding. The sooner you admit to yourself that you might be suffering from something like depression or anxiety, the sooner you’ll start to feel normal again. It goes beyond declaring to everyone around you that you have some sort of mental illness. Hell, this is the first time I’ve actually publicly discussed being bipolar. And you know what? I don’t care anymore because it’s as much a part of my life as anything. It’s you that has to admit it. It’s a battle on the most personal level, and it’s something only you can overcome. Because who else knows you better than yourself? Be strong, my friends. We as humans have been gifted these magnificent minds with their tiny sparks of imagination — and all the horrible, illogical, unforgivable thoughts that come with them. If you or anyone you know are suicidal, please seek help immediately. If you just need someone to talk to or would like to contact Gin, reach him via email at Ando.gin.a[a]gmail.com or through twitter @GinAAndo. This is an amazing piece Gin, and you’ve shown a lot of strength and character to simply lay your story out there in order to help others. In my early 20’s, I suffered from anxiety and what my Dr. called hyper-vigilance whenever I was in a crowded public place like a Wal-Mart or noisy restaurant. It pretty much made me want to be a shut-in. It also caused some severe issues in my social and dating life. Luckily, through medication to help settle the chemical side of things, and a lot of effort put into understanding and recognizing the triggers, I was able to get to a better state. Oh, and meeting an amazing and caring women who later became my wife helped a lot too. It still pops up from time to time. I still get more nervous than I should before big events, and I have to actively tune out every freaking conversation within 100 feet when we go to dinner, but at least I’m out enjoying dinner. Thanks again for sharing your story. I hope that it helps someone else reach the place you have. Thank you for this. After battling with depression for over a decade and not wanting to admit there was a problem I finally sought help last month. It was a difficult concept to come to terms with, the thought that what had been normal actually isn’t, but overall I’m happy I finally made the decision. I was put on Prozac and after a few weeks I noticed a huge difference. I’m finally able to enjoy time with my wife and kids and I just feel…good. Nobody should have to live with depression and seeking help isn’t admitting defeat or showing weakness and articles like this finally helped me realize that. An informative, & believe it or not, positive article. A good piece. Great, candid article. Anything to tame that voice in your head that hounds you. I’ve never been in a manic state so I can’t address that but I have gone through several rounds of depression through the years so I will share some things I’ve learned that have helped me. Just so you know, I am NOT any kind of doctor and what follow is only what I have learned and done to help myself. Always see a doctor before it gets too bad. The first thing is, I’ve learned to recognize the symptoms for what they are. This may sound like a Captain Obvious statement but the symptoms really do mimic everyday feelings and your mind can trick you into not believing something is wrong. As I learned to recognize the symptoms, I was able to get to the point where I could trace them back to a ceretain day or certain set of circumstances that triggered the depression. At this point I may or may not be able to take corrective action against the trigger but at the very least I had a better idea of what I was fighting and what I needed to change to bring myself back to good. As I got better at recognizing the symptoms, I was able to head depression off that much faster. I’ve only medicated for depression 3 times (my first 2 go arounds with depression and one later episode) and the rest I’ve been able to pull myself back by catching the symptoms early enough. I’m not saying that it’s like flipping a switch, it still takes time to get past depression but you can shorten that time. Second, I’ve learned to recognize the trigger and deal with it. Some things I can change and some I can’t. I change the things I can so that they are not overwhelmiing. For the things I can’t change, I find a way to make them work for me, for the better. The mind is a terribly and awesomely fantastic thing. It can destroy itself as well as heal itself. Sometimes you’ve just got to help it heal itself. Really, really nice piece. Bravely done, sir. While only briefly mentioned, I really appreciate the inclusion of medication in this piece. Medication has needlessly gotten somewhat of a bad reputation for mental health over the years. It is as essential for many mental health needs as insulin for diabetes. This really helped me feel better, The last few days have been tough adjusting to some new things in life but reading this helped to calm me. Just wanted to say that it helped because as someone who suffers at a certain level with mental illness I appreciated it coming from someone struggling as well. I really appreciate this article. Thank you. 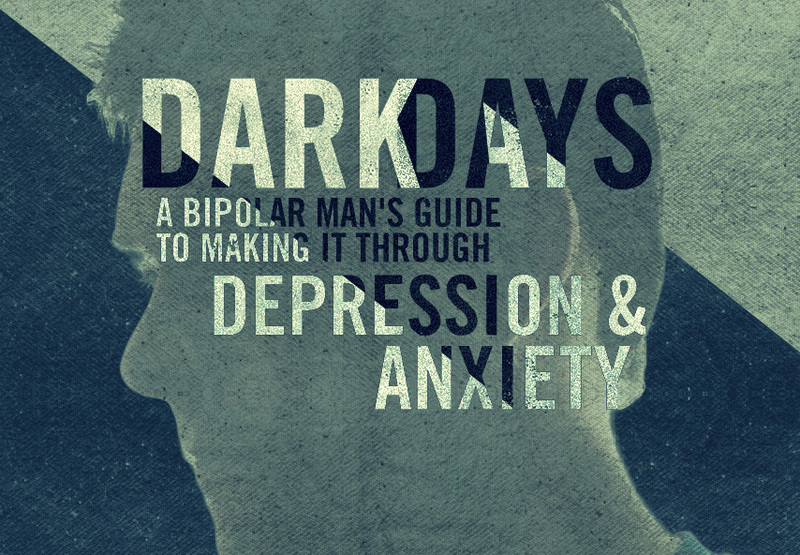 Naturally, I’d be delighted if you share this embeddable graphic on http://www.primermagazine.com/2014/learn/dark-days-a-bipolar-mans-guide-to-making-it-through-depression-and-anxiety , and/or share it with your followers on social. Either way, keep up the great work Gin!